Could iRobot Corporation Be a Millionaire Maker Stock? There may be more growth opportunities for iRobot than you think. iRobot Corporation's (NASDAQ:IRBT) stock has fallen nearly 40% from its 52-week high as everything from concerns over holiday discounting to weaker than expected guidance have hit the stock. Through it all, however, revenue and net income have continued to charge higher for the robotic vacuum maker. If we take a long-term view of iRobot's business, there's still a lot to like, and this could be a stock that generates a lot of wealth over time. Robotic vacuums may not sound like a booming business, but iRobot is already generating nearly $1 billion in revenue per year, and is just scratching the surface of its potential. According to iRobot's management, RVC's installed base of 13 million households is only about 10% of its potential market in the U.S.
Another way to look at it is that robotic vacuum cleaners (RVCs) only accounted for 23% of the $7.5 billion spent on $200+ vacuums in 2017. Competitors like Samsung, LG, Panasonic, and others have tried to enter the RVC space, but iRobot has maintained its niche and holds a 62% market share of RVCs globally. There's a lot of potential for RVCs to increase their market share globally, and that's a wave iRobot can ride for years to come. As much as I like iRobot's vacuum business, it's the company's growth into adjacent markets that will probably power long-term growth. iRobot isn't just developing a remote control vacuum, it's developing the controls that power the Roomba's movement and the mapping software that makes sure an entire home is cleaned. That's technology that can be used in a number of adjacent markets. iRobot has already extended the product line to the Braava mop and the Mirra pool cleaner. Both products extend the niche of cleaning robots, and leverage technology originally developed for Roomba. Management isn't disclosing what its high-risk growth projects consist of, but we know lawn care is an area where iRobot has tested products. The product hasn't hit the market yet, but it's easy to see how movement controls and mapping technology developed for the home could be translated to the lawn as well. What I like about iRobot is that it's a focused company with a profitable niche. An advantage of owning a niche like robotic vacuums is that development costs can be spread across a higher volume of sales. Operating leverage on development costs have combined with economies of scale to push margins 500 basis points higher in the last six years, and that trend should continue. iRobot has also just started to scratch the surface of its global potential. I mentioned that the U.S. market penetration for RVCs is only 10%, and U.S. sales are expected to account for half of all sales in 2018. iRobot has expanded into Europe, the Middle East, Africa, and Japan, but most of Asia and Latin America are still untapped. 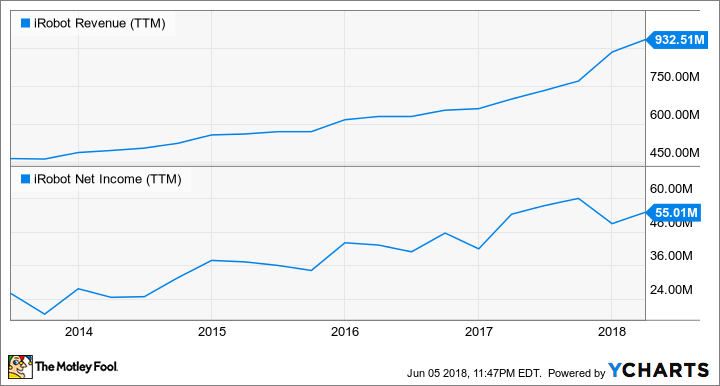 Shares of iRobot aren't cheap at nearly 30 times 2018 earnings estimates, but given the growth the company has demonstrated and the potential for growth going forward, I think it's still a great buy for investors. Long-term, it's the kind of stock that can make investors millionaires.